(Al Hartmann | The Salt Lake Tribune) Mixed use development along Sugarmont Ave. and 1000 E. in Sugarhouse. Sugarhouse Trolley, right, runs west towards State Street Tuesday May 1, 2018. A Housing Gap Coalition formed by the Salt Lake Chamber of Commertce is going to encourage local government officials to adopt more flexible zoning policies and to cut regulatory fees to stimulate the development of more types of housing, particularly units affordable for lower income people, in all parts of the Salt Lake Valley. The goal is to get more mixes of housing — high density, high rise apartments next to single family homes alongside smaller apartment buildings with some businesses too. Utah’s economic gurus are pushing the panic button about affordable housing. Unfortunately, it’s only the sprawlers who are panicking. 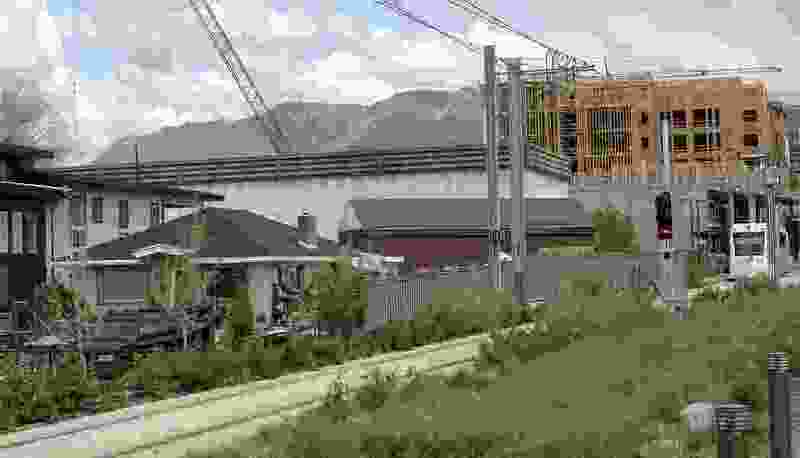 The Salt Lake Chamber last week launched a campaign to address the rising price of housing along the Wasatch Front. Both home values and rents are outpacing wage growth, and the result is a growing number of people who are being priced out of housing. Utah has been more successful than most states in maintaining a middle class built on homeownership. Zooming housing prices will test that. For those who are already buying homes, they at least have the advantage of seeing their own properties rise with the tide. But for those who are struggling to save for a down payment, every price increase just puts home ownership that much farther out of reach. As a result, the percentage of Utah residents owning their own homes has been inching down from 76 percent when the recession hit in 2008. There’s another factor — beyond Utahns’ control — that could turn a bad situation even uglier: interest rates. We still are enjoying relatively low mortgage interest rates, but the pressure to raise rates has been increasing. If rates do jump, more people will stay renting, which will keep rents high, too. No one escapes rising interest rates. If there is an upside here, it’s that more younger Utahns are starting to see a different way. That is, they’re seeing the traditional single-family home becoming too big of a bite, and not just a financial bite. The consumptive lifestyle of a big yard and a long drive to work is looking like their parents’ dream. They value access to transit and shopping over the ride-on mower. The problem is that the parents are still in charge, particularly in the suburbs. While business leaders and just about everyone else have been sounding the horn on affordability, residents in southwest Salt Lake County and in Holladay continue to fight tooth and nail against new projects that put more people on fewer acres. Residents perform an important civic duty when they question new developments. They are one-time decisions with far-reaching effects. But they can’t draw a line in the sand. We will double the population in the Salt Lake Valley in the next 30 years. The valley can’t get bigger, only denser. The burden of affordable housing will never be met by Salt Lake City alone. Suburbanites need to step up. The coming masses are their children and grandchildren.